At Two Rivers Coffee we believe that a great day starts with a great cup of coffee and a great Cup of coffee can only come from the world’s finest coffee beans. We find the world’s finest and freshest coffee beans. Roast them with skill and care, to provide our customers with superior coffees to please the most decimating of tastes. 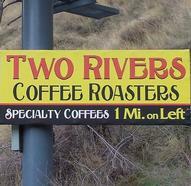 At Two Rivers Coffee, we offer a diverse variety of single origin, Blends and flavored coffees, each unique in their own right and always consistent in their quality. Our state-of-the-art roasting and processing techniques reflect our hands on experience. Here at Two Rivers Coffee we have a profound understanding of coffee, and an appreciation of the simple fact that the best beans provide you with that expected great cup of coffee.